At his London home, John Stone falls out of a window to his death. A financier and arms dealer, Stone was a man so wealthy that he was able to manipulate markets, industries, and indeed entire countries and continents. Did he jump, was he pushed, or was it merely a tragic accident? His alluring and enigmatic widow hires a young crime reporter to investigate. The story moves backward in time—from London in 1909 to Paris in 1890 and finally to Venice in 1867—and the attempts to uncover the truth play out against the backdrop of the evolution of high-stakes international finance, Europe’s first great age of espionage, and the start of the twentieth century’s arms race. 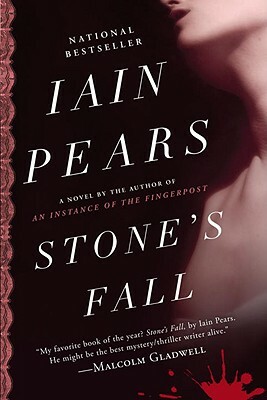 Stone’s Fall is a tale of love and frailty, as much as it is of high finance and skulduggery. The mixture, then, as now, is an often fatal combination. Iain Pears is the author of the bestsellers An Instance of the Fingerpost and The Dream of Scipio and a novella, The Portrait, as well as a series of acclaimed detective novels, a book of art history and countless articles on artistic, financial and historical subjects. He lives in Oxford, England.